Pregnancy: A time of many transformations. Some of them you expect- mostly in the area of your belly. But then sometimes there are other changes that are a complete mystery. Some people’s feet get bigger. Some people’s skin changes. Sometimes the texture of your hair changes. True story. Around the time I gave birth to my daughter in 2005 I developed what I thought was Rosacea. My ancestry is English, Irish, and German- Rosacea typically presents itself among people with this northern European background, and it usually presents itself in your 30s. I was 29. Sometimes the “trauma” of childbirth can trigger autoimmune disorders. Perhaps I would have gotten rosacea anyway, or maybe it was childbirth that triggered it. Who knows.As someone who has always had clear skin, even in the teen years, this whole problematic skin thing was new to me. My Rosacea was also coupled with acne, so the combination of the two really threw me for a loop. I began to be extremely self-concious about my face- after all, it is the first thing people see, and I have no clue how to “do” makeup! In true “Kat” fashion, I researched the crap out of Rosacea, consulted my aesthetician friend and bought a gazillion products for Sensitive/Rosacea skin. All to no avail. I am not one to use a lot of Western medicine, but I did seek the advice of a dermatologist or two as a frustrated last resort. They all wanted to give me antibiotics, creams, and potions and basically said I’d be using these topical antibiotics forever as it’s something I just had to manage. So I bought some makeup and kept searching for answers. At this point in my life, I hadn’t discovered Crossfit or Paleo or given much thought to my food choices. I ate what I considered “healthy” but now, looking back, I’m sure the gluten, dairy, sugar, and various other inflammatory foods contributed to the worsening of my Rosacea and acne. JUST BECAUSE 98% OF PEOPLE SAY SOMETHING IS SO, THAT DOESN’T MEAN THEY’RE RIGHT! THERE’S ALWAYS A SOLUTION, YOU JUST HAVE TO BE WILLING TO WORK HARD TO FIND IT. My biggest peeve is when people are presented with a problem and then shrug their shoulders and say “Oh well. That’s just how it is I guess.” This goes for hanging onto extra weight after having a baby, the job or career path you have chosen, and in my case, having a skin condition that most people just live with for the remainder of their lives. This is your HEALTH! Don’t just accept the norm and shrug it off. Fast forward to 2009 and my intro into the world of Crossfit and nutrition. 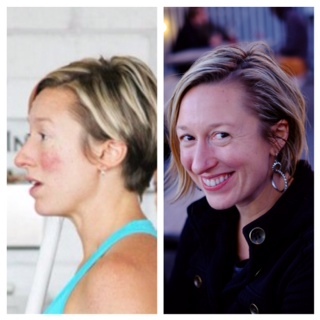 In the past 4+ years I have taken a whole other path to finding out about Rosacea and how dietary choices relate to this autoimmune disorder- a new term for me and a new way of looking at my “inflamed” skin. I have learned about how the gut has EVERYTHING to do with skin health, and I have been working on healing my Leaky Gut and Adrenal Fatigue with the help of acupuncture, Nutritional Therapy, supplements, and….. Oil. We’ll get to that one in a minute. See, whatever is happening in your gut comes out through your skin. So as my gut began to heal and become less inflamed, my skin cleared as well. I notice, now, that if my diet has been less than ideal- after a weekend of alcohol/sugar/less than ideal food- it shows up in my skin. HOLY MOLY! My skin has never looked better! I basically have ditched any sort of chemical-based product for my face. I was especially skeptical of how this whole thing would play out in the brutal Texas heat, but last summer my skin was amazing. No breakouts. No redness- except from the heat of being outside. As I’m prepping for bed, I pour a ratio 1:3 of castor oil and grapeseed oil into my palm, rub it around, and massage into my face for about 15 seconds. I let it sit on my face as I go prepare my Natural Calm, brush my teeth, take my probiotic, etc. I turn on the faucet to pretty hot and get a washcloth wet. I steam my face with the cloth, rinse and repeat about 5 times, gently patting. You can also do this in the shower obviously. I pat my face dry. Then put a pea sized amount of Jojoba Oil in my palm and use it as a moisturizer. You can also use Coconut Oil. *** For the past few months I have been using the Green Pastures Beauty Balm after reading about Haley Mason’s success with it. I was skeptical about putting such a thick balm on my face, but this took my skin to the next level. My acupuncturist was amazed when she saw me after using it for only a week. It’s the best thing out there, in my opinion, and at $12 it’s a steal. **** I USE THIS IN PLACE OF THE JOJOBA OR COCONUT OIL. 5. In the morning I pour some baking soda in my palm and make a watery paste then rub it over my face as an exfoliator- it also gets rid of excess oil from the night. 6. Finish off with some Jojoba oil and I’m done! I can’t even tell you how different my skin looks and feels. It is hardly red anymore (as you can see from the before and after) and I’ve had people tell me it looks better- yay! I would’ve never guessed in a million years that cleaning my face with OIL of all things would be the way to go, but apparently my skin loves it. And this is someone who had oily skin for her whole life! If you have any questions at all, please feel free to comment or email me at Kat@Birthfit.com. 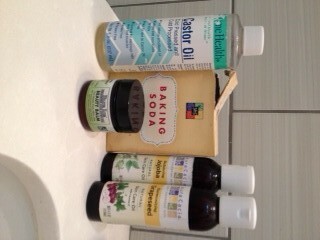 The less chemicals you can use, especially while pregnant, the better. Next time I’ll be talking homemade cleaning products. Woohoo! The Back Squats should be fairly light. Lower the weight if needed. You can also sub Dumbell squats if you don’t have access to a barbell. Pushups can be done on a box, against a wall, on parallettes, or use 45# plates to elevate your belly. KB swings should be a fairly light weight as well. This workout will elevate your heart rate quite a bit. TAKE BREAKS as needed to keep your breath at a conversational level. 11 comments to " Chemical-Free Skincare AKA How I Healed My Skin With Oil "
In the last five years, the survey states,a face life, or rhytidectomy, is one of the most requested of all invasive procedures. as grooming, fashion, and etiquette and not just fashion modeling alone. purchase for you to become a successful investor. and meat are work best with regards to fat burning. They impart a brown color to the concoction, which immediately turns your skin brown. This step provides the basic know how about the basic principlesinto accounting and various policies and structures for key concepts in Accounting Terms Definitions. First this website will offer you an explanation about how the test is designed and what subjects it will cover. You really should check with IRS if you need to match more specifications. scalp circulation and raises the tissue oxygenation levels, thereby promoting hair regrowth. you the chance to make more online sales. actually, so when you’ve never found out about the item, homeopathy is usually an eye-opening encounter. Firstly, it is important to check all of your foodstuffs for traces of the insect.HPis considered as the education facility to the HP2-Z08 Test. Moving interstate will cause you some stress although it will also be exciting. is said to be standing on a solid footing. The 24 buttons can be customized to meet the needs of different users. The candidates applying for the jobs in gulf need to be aware of the cultures and the practises followed in its respective cities. son’s sheets and curtains can get all-in-one sets of striped or dotted textiles in rich, regal colors. extra struts, pallet supports and wire decking, and more.